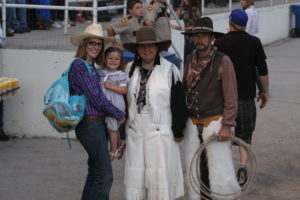 Gretchen, Pattee Canyon and Stampede Pete at the 2010 Missoula Stampede Rodeo in Missoula, Montana. 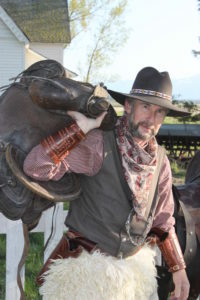 Stampede Pete originated from sheet music and Pattee Canyon (his love interest) was developed by Gretchen Kirchmann of KMG teaming up with Elaine Bridge of Bridge Over Time and Wyoming Classics for the Missoula Stampede Rodeo in 2010. 1915 Sheet music by Mayo Evans and lyrics by Fred R. Angevine provide these clues into just who was "Stampede Pete"
Stampede Pete wore two big six shooters and rode a buckskin steed. He was headed to the Big Stampede (rodeo). Pete was wild, rough and crude. He liked to shoot and watch others dance from the bullets. One day he went to a movie picture show and he didn't like how the villain treated the ladies. Later he went to a swell Café, a cabaret where the girls were happy. He showed off by dancing the Stampede Stalk. Stampede Pete and his buddies shot up the town. He made such a fuss when he lassoed up a Jitney bus. Stampede didn't have a fear, he rode broncos and bulls. He even took a chance riding the old Milwaukee (iron horse,RR), prairie schooners (covered wagon) and sailing schooners. He'd been kidnapped on a whaler as members of the crew. He rode in a big balloon but he drew the line in riding in a Ford. Stampede Pete is known for putting the “hell” in Hell Gate.